DAVIS, Calif. (AP) — Natalie Corona was a rising star in her police department with a sparkling smile and a huge heart who had followed in her father’s footsteps and became an officer, fulfilling a lifelong dream just a few months ago when her dad pinned the badge on her uniform. On Friday, her father and a stunned community mourned the 22-year-old who was shot and killed on duty while responding to a multi-vehicle crash in the small college town of Davis, California. Investigators believe she was ambushed by a gunman on a bicycle, but they haven’t a determined the motive for his actions. 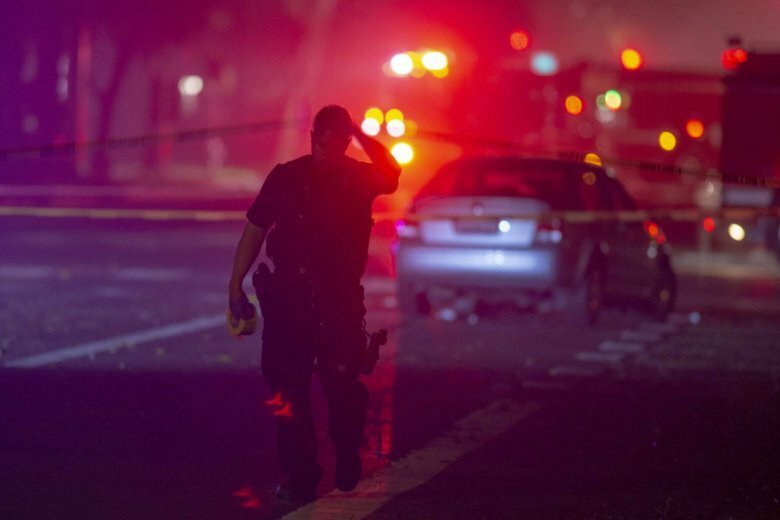 The shooter rode up on a bicycle and, without warning, opened fire as Corona was investigating a three-car crash in the town that is home to the University of California in Davis, where there has not been a fatal police shooting in nearly 60 years. She was struck in the neck. “This looked clearly to us like am ambush,” Police Chief Davis Police Chief Darren Pytel said Friday evening. At least two witnesses avoided injury. A firefighter who ran away as the gunman reloaded was hit, but the bullet didn’t penetrate his boot. A woman carrying a backpack found a bullet lodged in her textbook. After unloading gunshots, the suspect went to his home nearby and chatted with his roommate without “showing any sign he was involved in the incident,” Pytel said. A backpack dropped at the crime scene led officers to identify the gunman. During a short standoff outside his residence, the man came out with a bulletproof vest before going back inside, where he pushed a couch to block the front door and turned the gun on himself, Pytel said. Police found two semi-automatic handguns at the house. The attack occurred in a residential neighborhood up the street from a park that hosts a weekend farmer’s market. Residents placed flowers at a growing memorial outside the police department Friday, where flags flew at half-staff. Corona’s colleagues, family and friends mourned a vibrant life that was cut short. “She was the best of us,” said Davis officer Mike Yu, after placing a “Blue Lives Matter” flag at the crime scene, about a mile from the police station. As the eldest of four daughters, Corona grew up dreaming of becoming a law enforcement officer like her father, said her cousin, Emily Gomez, 26. “I don’t remember her talking about anything else than wanting to become an officer,” said Gomez, who said her cousin was an athletic star in high school, excelling in volleyball, basketball and track. She grew up in a tight-knit family in the Northern California town of Arbuckle. The family had emigrated from Mexico a few generations ago and had become established members of their community. Corona’s father, Jose Merced Corona, spent 26 years as a Colusa County Sheriff’s sergeant before retiring and getting elected to the county’s Board of Supervisors last November. Her mother is a first-grade teacher, and two cousins are also in law enforcement, Gomez said. Corona graduated from the Sacramento Police Academy last July and completed her training in December just before Christmas, officials said. “She was very proud,” her father told Fox40-TV, choking back tears as he spoke about how much she loved her job. Father and daughter smiled with pride in a photograph from Corona’s swearing-in ceremony at the Davis Police Department in August. The photograph published by the Williams Pioneer Review shows her father pinning on her badge as Corona stands with arms at her side and a big smile. One of the drivers in the crash, Christian Pascual, 25, said the shooter appeared to have been a bystander who fired from behind him. Pascual told The Sacramento Bee he got out of his car to exchange information with the other drivers involved in the collision when Corona arrived. Another witness, Shaun Kingston, said he heard at least 10 gunshots. From his vantage point, across the street, Kingston said he saw the gunman shoot at a firetruck and reload expertly. “I just watched him basically shoot at the firetruck, dump a clip and put another one in, then just start walking down (the) street like it wasn’t nothing,” Kingston told The Associated Press. Kingston said he didn’t see that an officer had been shot. He said as terrified bystanders ran, he saw the shooter calmly walk away before he lost sight of him in the crowd. Corona later died at UC Davis Medical Center in Sacramento. Lyssa Nicole, who trained Corona at the police academy, said the officer loved helping and protecting people. In December, the Davis Police department posted a picture of Corona on its Facebook page showing her bringing Christmas gifts to a family who lost their home in the deadly fire that had destroyed the town of Paradise weeks earlier. She carried a Santa Claus-like sack that said “Happy Holidays” over her shoulder. Corona’s own Facebook page includes a glamorous picture of herself in a royal blue gown, holding a “Blue Lives Matter” flag, with a tribute that now rings eerily. “I would like this photograph to serve as my gratitude for all those law enforcement men and women who have served, who are currently serving, and those who have died in the line of duty protecting our liberties in this great country,” Corona wrote in the October 2016 post. Davis police spokesman Doroshov said the agency hasn’t lost an officer in the line of duty since 1959, when officer Douglas Cantrill was killed. Corona is the second officer killed in California in the past two and a half weeks. Cpl. Ronil Singh, 33, of the Newman Police Department was shot to death Dec. 26 after he stopped a suspected drunk driver. Gustavo Arriaga Perez, also 33, was charged with the murder. Authorities said Perez Arriaga was in the country illegally and was preparing to flee to Mexico when he was arrested. That killing rekindled a debate over California’s sanctuary law that limits cooperation by local officials with federal immigration authorities. Gecker and Associated Press Writers Daisy Nguyen and Janie Har contributed to this report from San Francisco.